Prostate cancer is one of the most frequent malignancies in men worldwide. Its metastatic behavior is well known, with gastrointestinal involvement being rare; however, as survival increases in patients with prostate cancer, metastases occur in unusual locations. We present the first case reported in the world literature with simultaneous duodenal and pancreatic involvement and fourth case with duodenal and pancreatic involvement separately. We report the case of an elderly patient with a history of prostate adenocarcinoma treated surgically 5 months ago, who presented with chronic abdominal pain, jaundice and choluria. The CT scan showed solid tumor in the head of the pancreas. Upper gastrointestinal endoscopy revealed an irregular ulcer in the duodenal bulb and extrinsic duodenal compression. The result of the pathological and immunohistochemical study revealed a metastatic prostate adenocarcinoma. A 66-year-old male patient with a history of heavy cigarette consumption (46 packs - year) and prostate cancer (adenocarcinoma) treated with bilateral orchiectomy + radical prostatectomy was admitted to our hospital 5 months after surgery. He presented with 1-month history of progressively moderate non-irradiated epigastric pain associated with nausea, vomiting and hyporexia. Subsequently, jaundice and choluria were added. The physical examination at admission showed mild pallor, severe jaundice, a non-painful hard epigastric mass with a size of 8 x 6 cm with poorly-defined edges, and dullness in flanks. The laboratory tests showed hemoglobin 9.7 g/dL; creatinine 1.0 mg/dL; amilase 481 IU/L (<118); lipase 506 IU/L (<51); aspartate aminotransferase (AST) 68 IU/L (<34); alanine transaminase (ALT) 49 IU/L (10-49); total bilirrubin 21.2 IU/L (0.2–1.0) with conjugated fraction predominance (17.8 mg/dL); alkaline phosphatase 477 IU/L (45-129); albumin 3.1 g/dL (3.5–5.5); total prostatic specific antigen (PSA) 15.5 ng/mL; Ca19.9 >1200 IU/L (0-37); CEA 4.6 IU/mL (0-3); prothrombin time (PT) 15.8 (<13); partial thromboplastin time (TTP) 38.4 (<37). The ascitic fluid analysis showed pleocytosis (216 leukocytes/mm3) with lympho-mononuclear predominance (91%) and cytological analysis revealed malignant cells compatible with adenocarcinoma. The upper gastrointestinal endoscopy showed in the posterior wall of the duodenal bulb, a non-stenosing irregular ulcer that involved 50% of the circumference (biopsies were taken) and associated extrinsic compression that extended through the second duodenal portion also. Contrast-enhanced CT scan revealed inguinal lymphadenopathy and osteoblastic bone metastases in left coxal bone. The patient underwent peritoneal catheter placement for ascites evacuation, which was removed 6 days later by negligible residual volume. Subsequently, an external biliary drainage catheter was placed at the level of the left hepatic duct. Patient showed favorable clinical course and was discharged with palliative care (Figure 1 & Figure 2). Figure 1 1A: Contrast-enhanced CT scan: a hypodense heterogeneous poorly-defined mass of the head of pancreas (arrows) and retroperitoneal and mesenteric lymph nodes (arrowhead). Scarce peri-hepatic ascites. 1B: MR cholangiography: Moderate intra and extrahepatic bile duct dilatation. Figure 2 (A) Microphotograph showing poorly differentiated carcinoma with solid pattern in the lymphatic vessels and lamina propria of the duodenal mucosa (H-E, 100X). (B) Immunoreactive for Cytokeratin A1 / A3 (200X) and (C) Prostate Specific Antigen (PSA) (200X). In conclusion, in the presence of a gastrointestinal tumor and a history of prostate cancer, the possibility of metastasis must be always considered (although digestive involvement is uncommon due to this cancer), especially in patients with a long history of disease and who had already metastases in other organs. Siegel R, Ma J, Zou Z, et al. Cancer statistics, 2014. CA Cancer J Clin. 2014;64(1):9–29. Bubendorf L, Schöpfer A, Wagner U, et al. Metastatic patterns of prostate cancer: An autopsy study of 1,589 patients. Hum Pathol. 2000;31(5):578–583. Kaswala DH, Patel N, Jadallah S, et al. Metastatic Prostate Cancer to the Duodenum: A Rare Case. J Family Med Prim Care. 2014;3(2):166–168. Lee S, Lee T, Yeh H, et al. An unusual case of metastatic small intestinal tumor due to prostate cancer. J Chin Med Assoc. 2009;72(5):271–274. Kadakia S, Parker A, Canales L. Metastatic tumors to the upper gastrointestinal tract: endoscopic experience. Am J Gastroenterol. 1992;87(10):1418–1423. Malhi-Chowla N, Wolfsen H, Menke D, et al. Prostate cancer metastasizing to the small bowel. J Clin Gastroenterol. 2001;32(5):439 –440. Merkle T, Boaz T, Kolokythas O, et al. Metastases to the pancreas. Br J Radiol. 1998;71(851):1208–1214. Minni F, Casadei R, Perez B, et al. 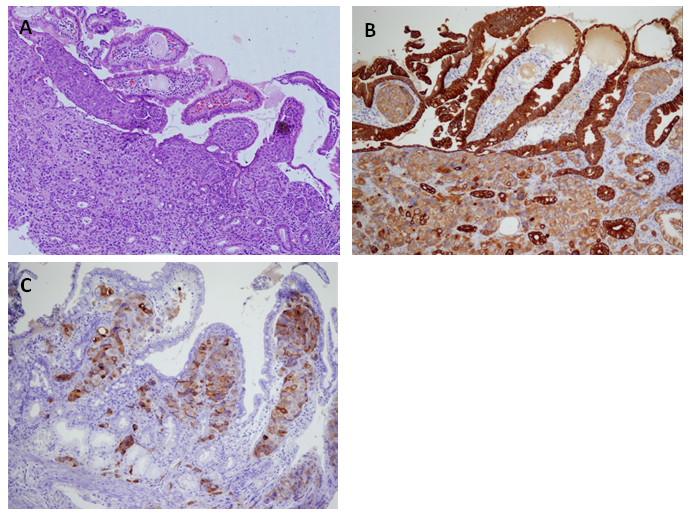 Pancreatic metastases: observations of three cases and review of the literature. Pancreatology. 2004;4(6):509–520. Zerbi A, Pecorelli N. Pancreatic metastases: An increasing clinical entity. World J Gastrointest Surg. 2010;2(8): 255–259. Whitmore W. Procedings: The natural history of prostatic cancer. Cancer. 1973;32(5):1104–1112. Jacob J, Chargari C, Bauduceau O, et al. Pancreatic metastasis from prostate cancer. Case reports in Medicine. 2010. ©2018 García et al. This is an open access article distributed under the terms of the Creative Commons Attribution License , which permits unrestricted use, distribution, and build upon your work non-commercially.